"As one of the returning 86 delegates who recently entered Gaza, I can attest to the need for peace in the region, and the urgency for lifting of the illegal blockade on Gaza. Simply put, Gaza can't wait," stated MWA Director, Aishah Schwartz. WASHINGTON, D.C. (MWA) March 23, 2010 – Muslimah Writers Alliance (MWA) joins Jewish Voices for Peace (JVP) in demanding that Israel freeze illegal settlement expansion in light of last night's comments by Israeli Prime Minister Bibi Netanyahu in defending settlement expansion in Jerusalem by insisting on the historic right of Jews to build anywhere in the city, including the eastern section. Today Minister Netanyahu will meet with U.S. President Obama to reiterate his position. But Netanyahu is wrong, and Secretary of State Clinton and President Obama, who have called for a settlement freeze as the first step towards a true peace, are right. 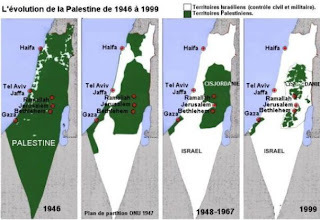 East Jerusalem was illegally annexed in 1967. The 1,600 Jewish-only housing units the government has approved for construction are illegal according to international law. AIPAC's annual policy conference will continue throughout this week (March 22-26), and thousands of members will be lobbying members of Congress, telling them that the Obama administration is too hard on Israel. Why? Because the US dares to insist on a settlement freeze. Now is the time to demand full accountability, ask the US to withhold its aid to Israel until Israel agrees to abide by international law including ending settlement construction and lifting the blockade on Gaza. Only through accountability will we achieve a lasting peace. Send a letter to President Obama telling him that you support the administration's demands for an end to settlement construction in both the West Bank and East Jerusalem— but don't stop there! Ask him to withhold U.S. aid to Israel until it agrees to abide by international law, including lifting of the blockade on Gaza. Sending your letter to the President could not be easier with JVP's online platform — or you can fax your letter to (202) 456-2461. Alternatively, and respectfully, you can also voice your concerns by calling (202) 451-1111. There's more! Now is the time to let Congress know that AIPAC doesn't speak for YOU—use JVP's online form to find your representative here. Say 'NO' to Israeli settlements and unconditional aid—the primary barriers to peace! MWA echoes JVP in its message to you! Don't settle down, don't calm down, don't quiet down just because some people think it's OK to take Palestinian land at will. Settlements are wrong. They're illegal, they're immoral, and they enable thousands of Jews to live on land that doesn't belong to them. Settlements come at the price of Palestinian lives and livelihoods, Israeli security, and American lives, as General Petraeus stated last week. Settlements are incompatible with a just peace, and they're made possible by U.S. support. Let President Obama and Congress know that AIPAC doesn't speak for us, and that the time is over for unconditional aid to support settlement expansion and human rights violations. It is integral to achieving lasting peace. "As one of the returning 86 delegates who entered Gaza (Dec. 30, 2009-Jan. 2, 2010), I can attest to the fact the need for peace in the region and an end to the blockade on Gaza cannot be facilitated fast enough. Gaza can't wait," stated MWA Director, Aishah Schwartz. Join the more than 3,000 fans of Jewish Voice for Peace on Facebook.